If you have a scale, I suggest using the gram measurements, for most accuracy. These cookies are best on the day they are baked. While still delicious, they will soften from the moisture in the oranges as they sit. Wash the oranges thoroughly under hot water and wipe with a towel. Cut into very thin slices (as thin as you can slice them and keep them in one piecand place on a doubled-up paper towel. Before placing on cookies, flip them over on to fresh paper towel to dry the other side a bit. In a bowl with an electric mixer, or the bowl of a stand mixer, beat softened butter with the egg until light and fluffy. Add ground almonds, sugar, flour and orange zest/juice and mix until dough comes together. Shape dough into two rolls, about 2-inches each in diameter and put into the refrigerator for at least 3 hours. Heat oven to 350° (180C). Slice each log into cookies about 1/4-inch and place on a baking sheet. Using the bottom of a drinking cup with a bottom about 1 1/2-inches, dip bottom of glass in to a bowl of sugar and press in to cookies, making a small indentation. Brush the top of each cookie gently with the beaten egg yolk. 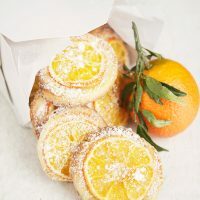 Put one slice of mandarin orange in the indentation that you made on the top of each cookie. Sprinkle with more sugar and bake for 14-15 minutes. If you'd like to brown up the cookies a bit, sprinkle with a bit more sugar over the oranges and place under the broiler for a few minutes. Remove cookies to a cooling rack to cool, then sprinkle with powdered sugar.